Just out of curiosity, I was checking out the Morningstar fair values for my companies and surprisingly, they were all very close, minus AEO. So just for fun, here is a comparison of the intrinsic values between the companies I have written about on this blog between Morningstar and my fair value calculator. Small caps are not covered by Morningstar, so I have left them out. So in the spirit of having some fun with stock valuation, it doesn’t seem like I need to bother with a premium Morningstar membership. I get pretty much the same quantitative assumptions with 100% control. You too start saving time and value stock quickly and automatically with the stock valuation calculator. Good article! I wanted to see if you might want to be a contributor for our site, http://www.erollover.com . We are looking for content contributors, and it could get some exposure for your site. Also, please check out our article submission section for bloggers that helps to create good backlinks for the search engines to pick up your site. As you can see, my numbers are much lower due to the fact that my valuation puts a today’s market value on the company rather than a 5, 10, 15, or 20 year projection that most often never comes to fruition. Interesting nonetheless. Anyway, here’s my point. If I’m that far under you on most of your valuations and not one of my valuations is higher than yours, then if one of my valuation is the same or near one of yours; it probably is a stock that you, me, and others should purchase as much as we can of. I use DCF because earnings can always be inflated and doesn’t provide the real picture. A recent company I made a mistake on was AERO. They had their first profit, but looking at the cash flows showed a completely different story. I’m also the typical value guy that doesn’t even consider or believe in beta so its impossible for me to use WACC. The “Old School” philosophy of the greatest investors, Graham, Buffett and Fisher never mentioned using beta, so I’ll take their word. I’ll just stick to investing in a simple manner. Analyze the business and then find the value to the nearest dollar or so. No need to worry about decimal places, risk premiums, taxes etc and other FASB accounting principles. I think we are all getting a similar value for ETN because of its predictability. If we did KO or SYK, I’m pretty sure the numbers would be similar. Just like to point out to everyone (if they read the comments) that I’ve been using several methods for valuing a business. Important thing is to know is which one to use and when. Owner Earnings – Capital Expenditures / WACC or whatever discount you feel appropriate. As you see, it has absolutely nothing to do with a company’s earnings (EPS). Sorry about that. Big difference. Sorry to post again. Just wanted to point out that although I believe EPV is the most accurate tool in my investment arsenal, I always evaluate a business on many different models to find some sort of common bond between them. Although not putting much trust in DCF, I do use it every time I value a business as well as Cost Of Reproduction (which you call Market Value), as well as Grahams Net-Net. Again, sorry to take up so much space on your blog. I thoroughly enjoy discussing security analysis. Very interesting. Take up as much space as you want because I’m learning something and I’m sure others will find it helpful as well. I’ll have to take a deeper look into EPV and see how it works. The book that talks extensively about it is called “Value Investing: From Graham to Buffett and Beyond”. Wiely Press puts it out. I found a copy through amazon for around $10. Bruce Greenwald is the main author and Judd Kahn, Paul Sonkin, & Michael Van Beima are contributing authors. Its really a great read and until I read a copy, I used DCF exclusively. I hope I don’t sound like I’m minimizing the effectiveness of DCF because I certainly don’t intend to. BTW, I’m the one who sent you the email on CPI Corp. I’d like to hear your analysis of it. Its dividend yield closed at 42.67% today. A ‘catalyst’ that is hard to ignore. I’ve got an intrinsic value of $25 on the company. Their book is $1.77 and their market price closed at $1.50 today. Their competitive advantage is due to their agreements with Wal-Mart and sears. A competitor entering their market is at an extreme disadvantage. They’ve paid a dividend for 28+ years (i’ve tracked them back to 1990 but they’ve been around much longer, 75+ years with sears). Their dividend has always increased over those 28+ years. The main catalyst to purchasing them NOW is that they just put out a press released on Nov. 11th, 2008 stating that they will pay the .16 per share quarterly dividend on Dec. 1st, 2008 to all who have purchased shares by Nov. 24th, 2008 (4 days away). That gives an investor to make a nice lump of change in the next two weeks. Again, the annual yield is 42.67% and their share price closed at $1.50 today. I can’t find any other reason why this company is trading so cheaply other than current Macroeconomic condition and investor fear. Would love to hear your input on it. Incidentally, the well known value investor Arnold Van Den Berg from Century Management has been adding to his position in CPI since September of this year. Arnold is a well known Graham style investor. I would stay away from this one. The first warning sign is actually that 42% yield. If what I learned from dividend investing is true, stay away from extremely high yielding stocks because it is bound to be cut. That’s whats happening to many dividend yielding stocks. I see from Google that they only raised dividends once. It was always at 14c and then raised to 16c. Further warning signs. their dividend payment in 2008 was 4.1 million. Their net income was 3.6 million. They are giving out more dividends than they earn and they probably took on that extra 115 million in debt just to do so. Total debt is very high for such a small company. Other factors include not being able to increase FCF for the past 10 years, decreasing tangible shareholders equity over 10 years. The book value you quote includes debt. Total equity is really only 17million and they have 63 million in intangibles. I don’t know whether CPY has their own real estate, but if they have agreements with Walmart and Sears, Im assuming they set up a small studio inside. My intrinsic value came out to $26 only based on a 5% growth in organic FCF growth but I doubt this would happen. Graham tells me its worth $9 and the NNWC is negative so if they were liquidated tomorrow, you’d be wiped out. For me, the risk is far to high compared to the return. I like VVTV because even if their business failed, they have assets to liquidate and sell off. No debt as well which makes it even better. 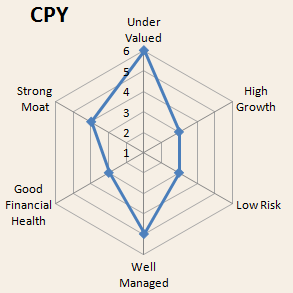 However, with CPY, they don’t really have much to offer for safety. Sorry I don’t believe I got that email. I searched my inbox but nothing showed up. Can you send it to me again please? Jae, thanks for your response on CPY. Couple things I want to pinpoint why I think your analysis is very incorrect. Of course I understand that you haven’t researched the company thoroughly so I’m not holding anything against you 🙂 But, here’s why you should take a deep look. First the Dividend. My records go back to 1990. Up until Aug. 15th, 1989 they paid a dividend of .10 per quarter. From Nov. 20th, 1989 – Aug. 14th, 1990 they paid .12 per quarter. From Nov. 13th, 1990 – May 15th, 2003 they paid .14 per quarter. And from Aug. 14th, 2003 – Present they pay .16 per quarter. This company has been in many recessions and never faltered on paying their dividend. For over 28 years they payed a dividend. They’ve been in business with sears for over 75 years. They’ve been in business with Wal-Mart for over 10 years. Their debt has always been low except for this year which is the first year they’ve taken on significant debt. The reason is because they’ve upgraded all their studio’s inside of every Wal-Mart and Sears to digital. Before they were Analog. Going Digital allows them to cut their costs in half. Their cost of revenue as well as their debt is going to be very low because of this upgrade in the coming years. Mark my words, their dividend is not going to decrease. There’s always exceptions to the rule and this is one of those cases. About their business. You’re correct, they don’t own real estate. Every Wal-Mart photo center is owned and operated by CPI corp. Every Sears picture me studio is owned by CPI. Wal-Mart is expanding very big into China right now. CPI has a global position because their agreement with both Wal-Mart and Sears is to be in EVERY Wal-Mart and Sears around the world. So, When Wal-Mart expands, so does CPI except CPI doesn’t have to pay for the building so there’s no real estate debt to incur. My EPV is much more conservative than a FCF or DCF model, its one reason why I put more faith into it and I came up with $25.00 per share using the EPV model. That model tells me what the company is worth right now, today. Not in 5, 10, 15+ years from now. I bought more shares this morning and hope the stock goes lower so I can buy more. I honestly believe in my 10+ years of investing, this is the best opportunity I’ve seen. The Dividend is going to be their. Even though I never purchased this company based on their dividend, it is icing on the cake in my mind. Look forward to hearing more from you. I also want to share with you a calculation that has been around since 1968 called the Altman Z-Score. You may or may not have heard about it. I would imagine you have if you do M&A deals. This score is used extensively and is considered a ‘standard’ in determining whether a company will go bankrupt within a two year time period. It carries a 70% accuracy rating. If a company receives a score of 2.6 or higher, there is a 70% chance that the company will not go bankrupt. 1.1 – 2.6, a company is in the ‘grey zone’. If a company’s score is less than 1.1, there is a 70% chance that they will go bankrupt within 2 years. In the investing world, any tool that carries a 70% accuracy rating is a tool I’m going to use. Again, this has been around since 1968 and has been deemed as the ‘standard’ testing device used my accounting firms when determining an M&A deal. CPI Corp’s Z-Score is 4.06. Having a Z-Score that high especially when they’ve never taken on so much debt is also another reason why this is a great investment opportunity in my opinion. Would love to hear your thoughts. 1.Dividend payment confirmed for shareholders as of Nov 24. This is very enticing. May take a nibble. 2.Walmart may be expanding but what about Sears? 3.The level of photography? Cheap? Expensive? 4.What was the reason for the sharp decline in FCF in 2004-2006? Was it due to heavily investing in the business and do you think the turnaround already happened in 2007? I’ll start reading some reports and try to get a better picture. I can answer some of those questions now but I’ll give you a detailed answer to question number 4 by tomorrow. “CPI Corp. today announced that its Board of Directors declared a fourth quarter cash dividend of 16 cents per share. The dividend will be paid on December 1, 2008 to shareholders of record as of November 24, 2008. As of November 7, 2008, CPI had 6,486,078 common shares outstanding. CPI is the leading portrait studio operator in North America offering photography services in approximately 3,100 locations in the United States, Puerto Rico, Canada and Mexico, principally in Sears and Wal-Mart stores. 2. The only expansion in Sears business that I see, and its pure speculation, is that Mr. Lampert has been buying up controlling shares of both AutoNation and AutoZone for quite some time. What would that do for CPI’s business? I don’t know but I would venture to say that CPI would be unaffected by it. Sears is in the business or Real-Estate and their sales of products is just an added benefit to their primary focus which is real-estate. The retail benefit of CPI really comes from Wal-Mart, although they’ve been a successful business long before their Wal-Mart relationship. Before Wal-Mart, their growth had been slow but steady. 3. They are the #1 leader of their industry. The competitive advantage they have is the global relationship they have with both Sears and Wal-Mart. It would cost a competitor approximately $231.52 million just in Plant/Property/Equipment in order to build a competitive business. That competitor would spend $231.52 million for the chance of receiving approx. $100 million in revenue. That is a huge barrier to entry for CPI. I personally use CPI’s product. I have a digital camera in which I take my digital card into my local Wal-Mart store. I walk up to the machine and stick my digital card in the machine and for .15 I get a printed picture. Or I can have the professional that’s working behind the desk do it for me if I’m not competent enough to figure out how to work the machine. Over the weekend, I’ll put together a detailed analysis of the company so it will be easier to understand. It may take me a few days because I’d like it to be detailed. I really feel this is a great company and I’m hoping I’m right. Have a great weekend. It reminds me of Photochannel (PNWIF) which takes care of all the back end solutions for costco and some major businesses I cannot recall. If you get an analysis written up, would you mind doing a guest post here? It’d be great to hear from another perspective. Hopefully I’ll have time to look over it on the weekend also. Your beginning to get me really interested, as I am also an avid photographer and understand what is involved. Jim do you think this is a good representation of CPY? I still havent had time to look into it. I don’t read charts so you’ll have to help me with this. Is your chart saying the company, on a scale from 1 – 6 (6 being extreme), is extremely under valued? My answer is yes. Concerning high growth factor, the rating is a 3? I’d give it a 4 but 3 is suffice. You’ll have to clarify risk. Risk means so many different things to so many different people. Well managed is a 5? I would agree with that. Possibly a 6. Good financial health is a 3? I’d say at least 4.5 to 5. Strong Moat is a 4? Strong Moat as in durable competitive advantage? I’d give it a 5. If I’m reading the chart correctly, it is very close to how I feel. Yes spot on. The closer it is to the outside, the better. The holy grail of all companies would be a hexagon. Something that has constantly eluded me. I may have to adjust risk as I read more into it but at this point in time, that how I see the company. I just thought of this chart recently so I’ll do a quick post to let people know how I intend to go about rating companies now. I like the chart. Is there a copy available that I could implement into my analysis’? I came across the idea while I was at work and looking at some graphs. It’s simply a radar graph in excel. I haven’t gotten to the part of automating it though. Need to think about how I will incorporate it. Whatever happened to the analysis on CPY? that was an interesting exchange. In hindsight, the company did excellent going from $1 to $20 in the last 52 weeks. However 2009 doesnt look so good with the negative FCF figures. Well in the end, I never took action and missed out on a 10 bagger. Had I listened to Jim and actually taken the initiative to make my way to a Walmart and simply check it out, I probably would have changed my mind. Jim capitalized on the opportunity and was rewarded. I’m trying to purchase the spreadsheets however do you have an alternative non-paypal route to purchase? it won’t accept my credit card.